Colonic diverticulum is the most common incidental finding during colonoscopy. It is a structural alteration of colonic wall, which is defined as mucosal and submucosal outpouching through the colonic wall. Most colonic diverticulosis patients remain asymptomatic, and only less than 20% of the patients present clinical symptoms. Some patients with colonic diverticula develop complications such as diverticulitis and bleeding. Pathogenesis, clinical characteristics, and classification of colonic diverticular diseases have been established according to the progression of diagnostic modalities such as endoscopy and radiologic methods. Recently, persisting endoscopic and microscopic inflammation have been known as a significant finding in diverticular disease, and those evidences expand the concept of diverticular disease to encompass a range from acute illness to chronic bowel disorder. Vascular anomaly representing aberrations in normal arteries, veins, or capillaries in GI tract may be solitary or multiple, isolated or part of a systemic disorder, and neoplastic. Vascular anomalies are increasingly recognized by clinicians as a common cause of gastrointestinal bleeding. The most common vascular anomalies in the colon being evaluated by endoscopy are angiodysplasia and hemangioma. 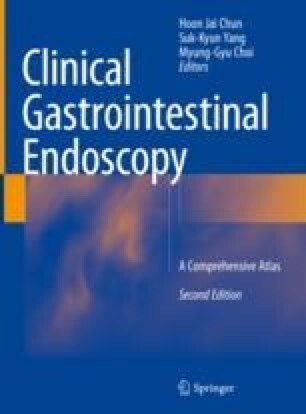 In this chapter, we review the clinical characteristics and endoscopic findings of colonic diverticulosis, diverticular diseases, and various vascular anomalies in the colon.